If you've been a reader of this blog, you know I use liquid starch and Roxanne's glue for my applique technique. A week ago, I decided to order glue sticks advertised on the videos demonstrating applique techniques in Yoko Saito's Quilt Mystere 2012. I suppose it wasn't so much the glue but the special method Beatrice Airaud demonstrates that captured my interest. She doesn't or hardly clips her seam allowances on curves... it seemed easy so in order to evaluate the process, I wanted some of the same tools she uses. http://www.youtube.com/watch?v=4p4f_A40lWQ watch this video starting at 4:30min and you'll see how she uses the glue stick and her seam ripper to fold over the seam allowances. She uses the same method on curves with a narrow 3mm seam allowance. Well the glues and chalk pencil arrived on Saturday, a whole week ahead of expected date of delivery... perhaps that's why postage was so high! :( Karisma is the brand name, clearly Japanese as you can see. So I set out to try it on the next block preparation. As I don't like to be predictable all the time, I decided to prepare block no 6 instead of no 4 in Yoko Saito's Quilt Mystere; the reason for this is that block no 6 is the widest of all the blocks therefore I wanted to pick out the fabrics for those long strips before I use up some yardage. I bought mainly fat quarters for this quilt with a few larger pieces I thought would make great backgrounds. Blocks 4, 5 and 6 are done in narrow strips or layers rather than one large background piece. Interesting way to build them in layers. The glue is the color of the cap, in this case neon yellow. It dries clear: in the next photo, it's not quite dry but the amazing thing is it does remain supple just like Beatrice Airaud says in the Quiltmania video. That to me is fantastic. 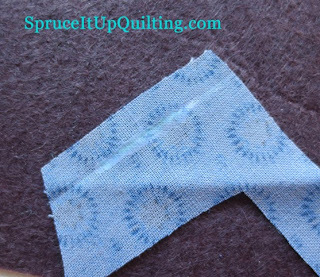 Furthermore, the needle and thread glide through the glue with no stiffness or residue left on the needle! It also washes out easily. 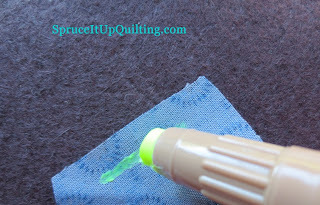 Beatrice's technique is a great one if you draw or trace the pattern directly on the fabric. However after trying it on a few pieces for Block no 6, it's clear Beatrice has mastered this technique because it isn't as easy as it looks. I need more practice to be convinced enough to change from my trusted freezer paper method. More testing will be needed too with glues and I intend to compare it with what is available on the market. I have tried regular glue sticks and the fabric ends up as stiff as a board with great difficulty pushing a needle through it. 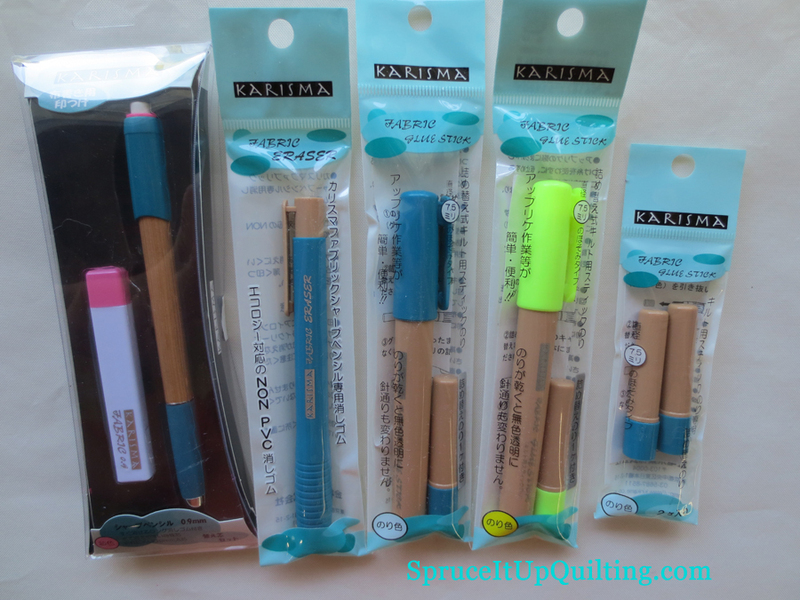 There's a product called Sewline that looks similar to the Karisma glue pen and I plan to test it as well. Elmer's glue is also one touted by Sharon Schamber and must be the least expensive to use. It, like Roxanne's glue are set with a dry iron. But they leave the fabric stiff when dried. We thought our problem was because of a backyard tree that had grown too large and was blocking the satellite so we had it trimmed back but alas, it wasn't the cause. A call to our provider and a few system checks later told them our problem was with the equipment not getting a signal! DAH!!! Isn't that why I called in the first place?? A technician is coming on Tuesday. I do love that Karisma chalk pencil in pink. There's a new version just out on the market that has 3 colors in one pen. The "lead" is 0.9 which is quite thin and makes a beautiful mark. Block No 3 is next to my rocker and is partly done! Big houses on that block so I expect it will go a little faster. 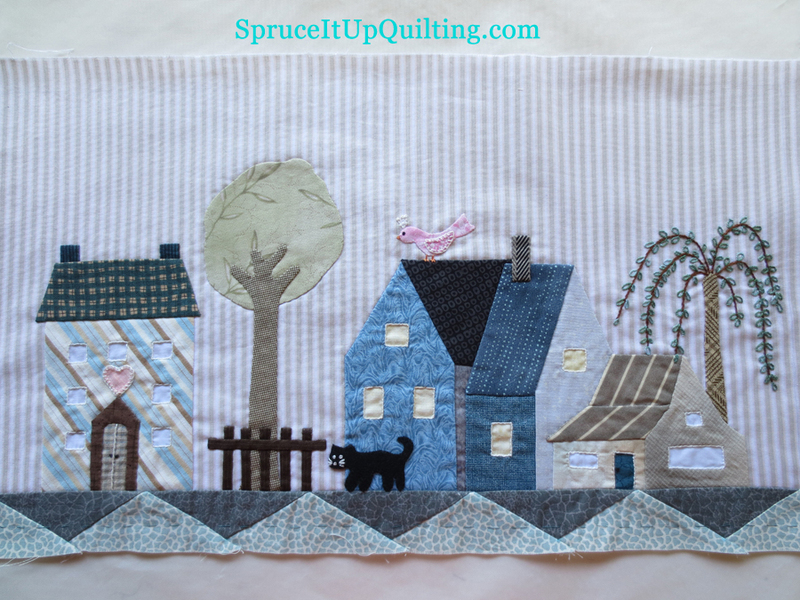 However, I'm impressed with the number of windows and doors on this quilt... they're all reverse appliqued then embroidered! Scrap, Quilt and Stitch has a new mystery quilt starting this week! It's called "De Deauville a Cape Cod"; I'm a sucker for a beach-themed quilt so I got on board. Her instructions are in French but perhaps you can ask her for an English version. 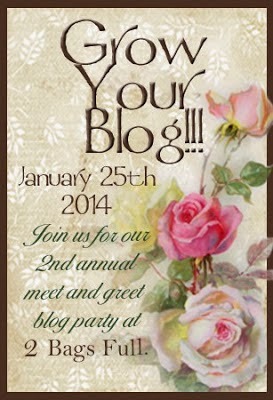 Blogger will translate her blog too. I already have her Eastwood Village pattern but have not started it yet. Love her Santas too. Head on over there and take a peek at her previews.